Summary: The use of winter annual cover crops has become increasingly popular as a form of early season weed suppression and for other agronomic reasons. When untreated soybean seed is planted behind freshly killed cover crops, insect pest issues can arise. 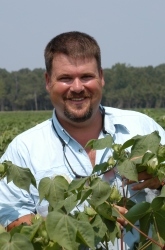 This presentation will help consultants, county agents, growers, and other practitioners make proper pest management decisions in soybean planted behind cover crops. Specifically, practitioners will learn when to time cover crop terminations, preventative treatment options, and which cover crops have the greatest influence on insect populations.